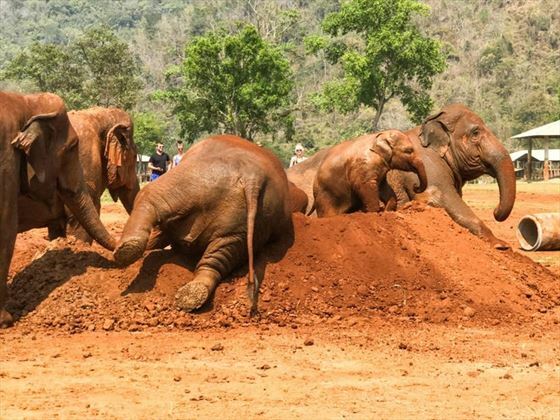 The Elephant Nature Park has been established for nearly 30 years and is a sanctuary for elephants rescued from tourist shows, trekking parks and the logging trade; watch their constantly growing herd bonding with one another in family groups and living with a new lease of life. Visits to the park are available year round and suitable for all ages, and choosing an overnight stay allows plenty of time to relax, observe, and learn about their behaviours and their care at the centre and to get to know the individuals themselves. Meet Yai Bau, 100 years old with a very hard working past, she now looks after the orphaned babies or meet Mintra, 20 years old and freed from begging in Bangkok, now a happy mother raising her young in the safety of the park. 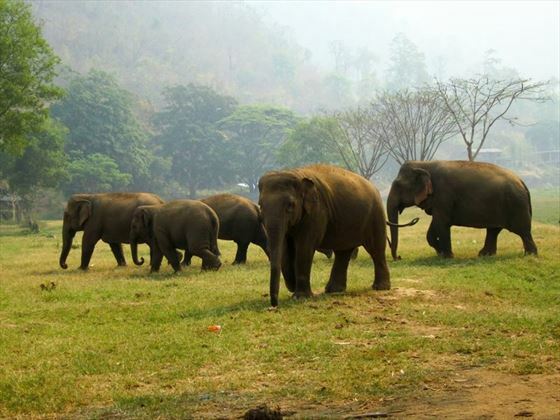 The camp is set in the verdant Mae Taeng valley, bordered by a river where you will be able to feed the elephants, and surrounded by forested mountains; the scenic one hour drive offers an insight into traditional rural life in Northern Thailand. 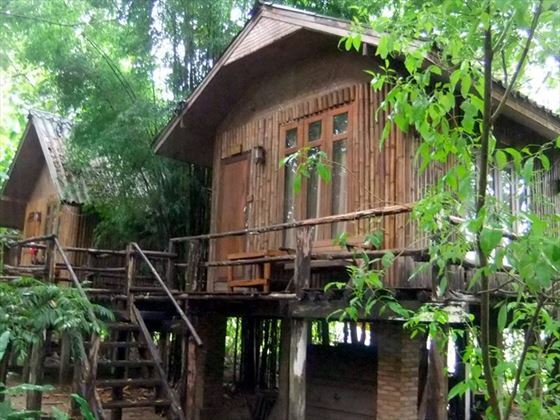 At the park, you will enjoy buffet lunches and a full dinner before your sleep-over in a traditional Bamboo hut; fall asleep to the sounds of the herd, dreaming about your wonderful experience. The below is a typical itinerary for visitors but might vary dependent on the elephants’ needs. 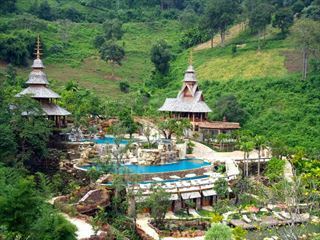 You will be collected around 8 - 8:30am from your Chiang Mai city hotel for a shared transfer to the Nature Park. 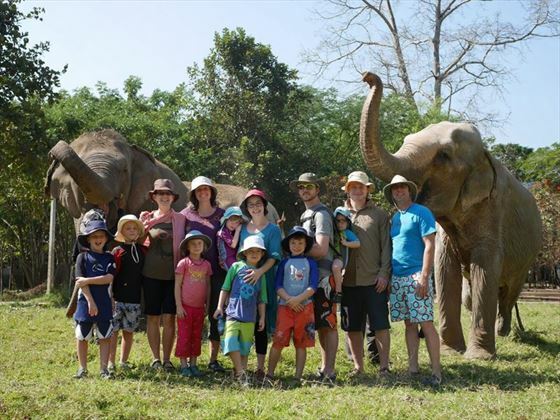 Start your adventure with an introductory orientation talk and video, to learn about the individual rescues, the workings of the park and how elephants are benefiting all over Thailand with various regional projects. LUNCH: Enjoy a wonderful vegetarian buffet lunch with Asian and European dishes. 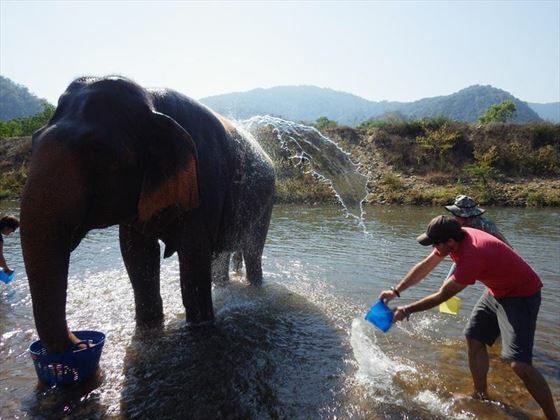 After lunch, walk with the elephants to the river, where you can watch them bathe. 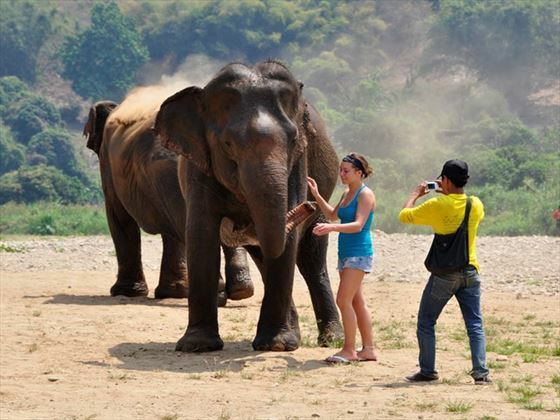 The experienced guides (mahouts) will teach you how to communicate with the elephants and help you start to identify individuals from their markings, shape and their character! Enjoy a full dinner with time to view the herd from the viewing platform or your accommodation, which is in stilted Bamboo huts. 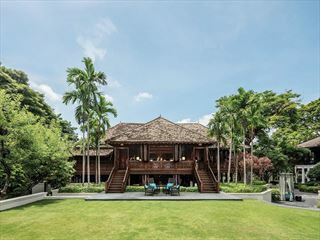 They are fairly basic and in keeping with their surroundings with fan cooling and mosquito nets so you can sleep with the windows open to enjoy the unique sounds of elephants whispering, snoring or trumpeting. 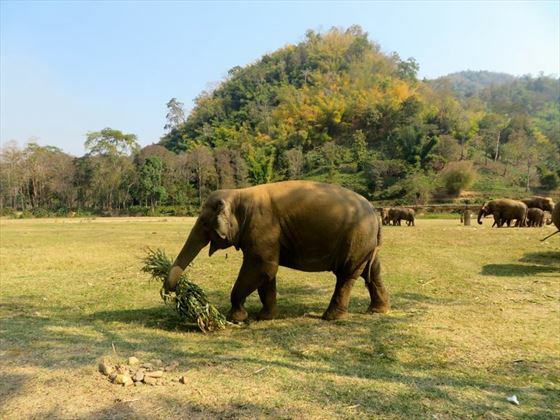 After breakfast, take a stroll with the elephants, assist with the preparation of fruits and then enjoy feeding time with the gentle giants from the feeding platform. After lunch, observe the herd in the river, one of their favourite activities. Late afternoon, say goodbye to the elephants and join your transportation back to your Chiang Mai city hotel, to arrive around 5:30pm. Single travellers will be roomed with other travellers of the same gender. 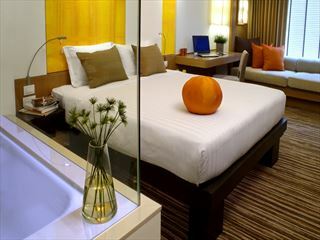 If a single room is required please speak to your travel consultant. There are luggage allowance restrictions: One small day pack and one carry on size overnight bag 56 x 36 x 23 cm) per person. Make sure you pack bag a change of clothes, hat, Sunscreen, sandals/flip flops, change of clothing, as you may get wet or muddy, towel, shoes for walking, camera and bug repellents. The elephants well being is important, therefore, the interaction with elephants will offer viewing and feeding these beautiful animals, no riding nor bathing with elephants will take place. You can store the remainder of your luggage at your Chiang Mai hotel as we would recommend returning for an overnight stay due to the late finish of the tour.